Using mobile marketing for fundraising has become commonplace. Anyone who has travelled on a train, read a newspaper or used the London Underground will have seen posters asking for, say, £3 via text to fund research into cancer treatments or to save an animal. 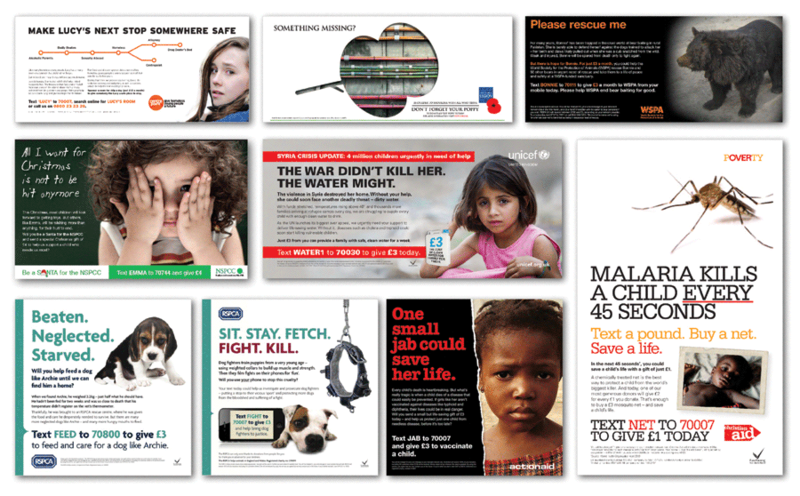 Direct Response Television (DRTV) adverts use SMS text as a response mechanism for charity campaigns: Unicef’s emergency appeal for Syria and the World Wildlife Fund’s sponsorship advertisement are just two recent examples seen on our screens. Increasingly, this method of acquiring new supporters only includes a mobile response. The convenience factor plays an important part in this. If I am sitting comfortably on a train and see a poster inviting me to get in touch or to give, am I going to stand up, squeeze past the assembled huddle of commuters and scan a QR code, call a telephone line or note down a website link – or would I rather just send a text message from the comfort of my seat? There are other reasons why mobile messaging remains an important part of the fundraising toolkit. For one thing, it is a highly dependable channel for acquiring or ‘prospecting’ new and often younger donors. One reason for this is the versatility of the text-to-donate mechanism. The short code number (and keyword) to which people are asked to send a text is a shortened version of a phone number, which is easier to read and remember than a normal phone number. The brevity of these numbers allows them to be printed in many places. They are familiar to passengers on trains and the Underground and have been used on billboard posters, television adverts, at events, on radio – even on the side of a drink carton. Mobile fundraising via SMS text messaging can serve as the perfect companion to other established fundraising channels. Several charities, for example, are now integrating text donations with face-to-face fundraising methods. It is not unusual to find fundraisers out in the streets or at a shopping centre asking passers-by to text in a donation. For supporters who are in a rush and fundraisers who are trying to work quickly to meet their targets, the benefits of text are obvious – it is quick, well understood and altogether less hassle than checking through direct debit forms. Text donations also provide charities with that often elusive fundraising ‘grail’ – supporter data. In sending an SMS text message, the sender is providing the fundraiser with a bona fide phone number that they can call straight away or add to their opted-in database for future use. This is quick and – importantly – reliable. For a fundraiser talking to someone on the street or by telephone, an SMS response mechanism means that there is no room for error. There are no missing digits or misplaced numbers – the supporter’s phone number simply appears automatically in a secure database the moment the message is sent. Mobile marketing also has the advantage when it comes to speed. This is important for fundraisers who attach great importance to making contact with donors as quickly as possible. When a supporter sends a text, their telephone number automatically goes directly into the charity’s database. A supporter can then be called back promptly – within hours, if not minutes. Speed is important where there are fundraising ‘asks’ that lend themselves to a quick emotional response from a supporter. Swift action enables charities to convert supporters into regular givers while the cause is still fresh in their mind. Mobile messaging and short code numbers will continue to be an important part of the charity fundraiser’s toolkit for some time to come. It remains one of the best-performing, quickest and simplest ways to acquire large numbers of new supporters. The technology is not standing still. Cymba is leading the development of text giving in a new and exciting direction by placing control over donations back in the hands of supporters. Our regular text giving service, Connected, now allows supporters to skip a monthly donation simply by sending a text. This has been well received by donors who value the flexibility that this gives them at a time when many are tightening their belts. Since January 2011, the regular giving service has processed over £1m for more than 30 charities. Connected is also helping charities to retain their donors during one of the most difficult financial climates for some time. of their bank account or cancelling their regular payments altogether now have another choice – skip one month and resume giving the next. As a result, supporters are more likely to keep giving for longer. When we compared the proportion of supporters who were still making a regular donation after one year using direct debits with the proportion who were still giving regularly by mobile, the difference was as great as 10 per cent – with mobile the clear winner. It was and has remained the case that putting control over donations back in the hands of supporters is a ‘win’ – not just for the supporter but for the charity as well. With each message sent, the charity also has the opportunity to communicate directly with supporters by written text as well as using video and images that can positively affect the donor journey and help reduce attrition. As long as mobile giving continues to keep pace with the preferred methods of donors, who want it to be flexible, simple and quick, mobile messaging will continue to be the marketing and payment tool that charities and their fundraising agencies can rely on – raising vital funds for the causes that need them most.